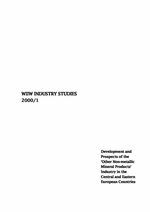 In the 1990s the 'other non-metallic mineral products' industry (NACE DI) -- in the following termed 'industry' -- has performed, in the individual Central and East European countries (CEECs), roughly in line with the entire manufacturing sector - and, broadly speaking, in line with the overall economy. In general, it has performed quite well in Poland, Slovenia and Hungary, less well in the Czech Republic and Slovakia, and rather poorly in Bulgaria and Romania. Although the industry's shares in output and employment of total manufacturing are currently not dissimilar, the industry's short-, medium-, and long-term prospects differ significantly across the CEECs. The performance of the industry is strongly correlated with that of overall GDP. The relatively weak GDP growth expected in the short, or even medium, run in the Czech Republic and Slovakia will restrict the industry's development there. By the same token, the state of the macro-economy will restrict the industry's expansion in Bulgaria and Romania even in the medium run. The much better overall prospects of Hungary, Poland and Slovenia will strengthen the demand for the industry's output. In these three countries (but also in the Czech Republic and Slovakia) massive infrastructure investment (co-financed by the EU) will additionally boost demand, possibly starting as soon as 2000-01. Everywhere the scale of construction activity to satisfy housing needs is desperately low. A revival of mass-scale housing construction, which is not envisaged in the near future, may be more likely in better-performing countries. On account of the level of advancement of 'systemic' changes, the industry will perform well in Hungary and Poland. The necessary changes, even if competently introduced, will take two to three years to bear fruit in the Czech Republic and Slovakia - and much more in Bulgaria and Romania. High investment in the industry's fixed assets in Poland, the Czech Republic and Romania indicates that in due time these countries should be capable of supplying higher-quality products at lower costs. However, because of the state of the 'systemic' conditions under which the investment decisions have been made in the Czech Republic and Romania, the actual efficiency of new fixed assets may turn out lower than should be expected. Also, because in either country the conditions have not forced the rationalization of energy use, the new capacities may not be as efficient as elsewhere. High investments in Poland are likely to produce the expected improvements. Relatively low fixed-asset investments in other countries suggest the possibility of deterioration of quality or relative production costs in the future. Despite the improving quality (and quality mix) of the industry's output, foreign trade in the industry's products has not been very satisfactory everywhere. Even quite weak overall GDP recovery visibly worsens the trade balance in the industry's products. One cannot expect the industry to become an export-oriented 'locomotive' for the broader economy. Unless there is a continuous real depreciation of the domestic currency (which is unlikely in most advanced CEECs where the policy makers dream of adopting the euro), the industry is bound to be losing to the EU producers. The losses in competitiveness of the industry are bound to be periodically checked by strong devaluations -- which will from time to time be necessary in response to excessive current account deficits. In all CEECs (except Slovenia) the export (and overall) performance of the industry will be subject to a rather unwelcome cyclicality. The situation is even worse in Slovenia where trade surpluses weaken despite sustained real depreciation. Foreign ownership, which dominates the Hungarian, Czech and Polish industry, has proven conducive to rising investment in fixed assets. In all probability it will also promote higher efficiency and lower unit labour costs - thereby increasing the industry's competitiveness. There are some problems yet. First, the foreign firms are more likely to respond properly, and promptly, to any misalignment in economic parameters (exchange, tax and interest rates, administered energy prices) than the domestic (and small-scale) firms. This will increase the risk, already high, of production volatility. Furthermore, unless there is some amount of harmonization of tax and competition-protection policies between the EU and the CEECs, the foreign-owned firms in the CEECs may under-perform in terms of exports, production or profits reported in the CEECs.